He wasn’t kidding. Unlike many people in the marathon community, I didn’t know about the famous Mad Marathon hills until after my registration had processed. I don’t know if I would have chosen a different race had I known that there were three ski resorts within five miles of the starting line, but with a plane ticket also procured, there was no backing away. When you live in Chicago, there aren’t many hills to be found. In order to get any sort of incline, you have to either leave the city or run up and down the same mound forty times in a row. In lieu of finding uneven terrain, some runners have suggested tackling urban parking lot ramps. Given the dangers present in running where drivers aren’t actively looking for pedestrians, I’ve kindly turned that proposal down. The treadmill also allows for serious climbing, but these days my love for that machine has swung fiercely back towards odium, so my options for strengthening my legs are severely limited. That said, I made it to the starting line with a modicum of confidence. The sky was hidden behind a heavy layer of clouds and fog, which occasionally showered the valley’s deep green. A chilly breeze paraded down Waitsfield’s main street, making us all suspect we had slept through summer and woken up in mid-October. You could feel the excitement in the crowd, even with the chance of rain. Marathon veteran and race staple Larry Macon was huddled in a bright red, long-sleeved shirt among the 800 runners, waiting for race organizer Dori Ingalls’ pistol to fire. Once it did, we were treated to a rare, flat stretch of road, just enough to tease us. 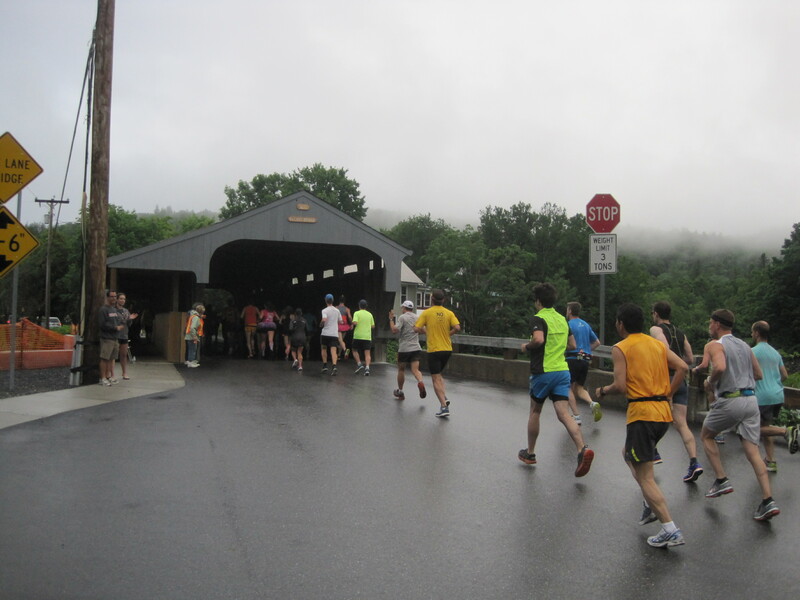 After running past Waitsfield’s tiny Main Street, we turned right towards a covered bridge, which acted as a gateway to the race’s many climbs. For much of the race, we were always just a minute away from significant elevation change, surrounded on all sides by a dark green envelope, with an ever looming threat of gentle rain. Within the crowd was Laura, who had been there with me for four other states, and Erin, who had shared three completely different ones. Also in the mix were Phil and Aparna, two new friends who had joined the weekend adventure. I was the only one running the marathon distance, while Javier was still sleeping, proud to be the only non-runner. Two miles into the race, as we reached the top of a dew-drenched hill, I was surrounded by heaving gasps. I couldn’t tell if these runners were able to continue another 11 or 24 miles on such labored breathing, or if they had all badly misjudged the elevation. My legs were already much heavier than usual, but my slow pace and quick steps were keeping my lungs from requiring more than a standard gulp of air. But if this gradual uphill continued, I wasn’t sure how much longer I’d be able to keep it together. What went up soon came down. As someone with legs made for taking large, bounding steps, I let myself lean forward, meeting the downward slope with my toes, and barreled toward the next covered bridge with eagerness and celerity. It soon became clear that this race was going to be an extended fartlek run, where I would violently change from a measured and focused 10-minute jog to a reckless, arms-swinging 6-minute dash in seconds. 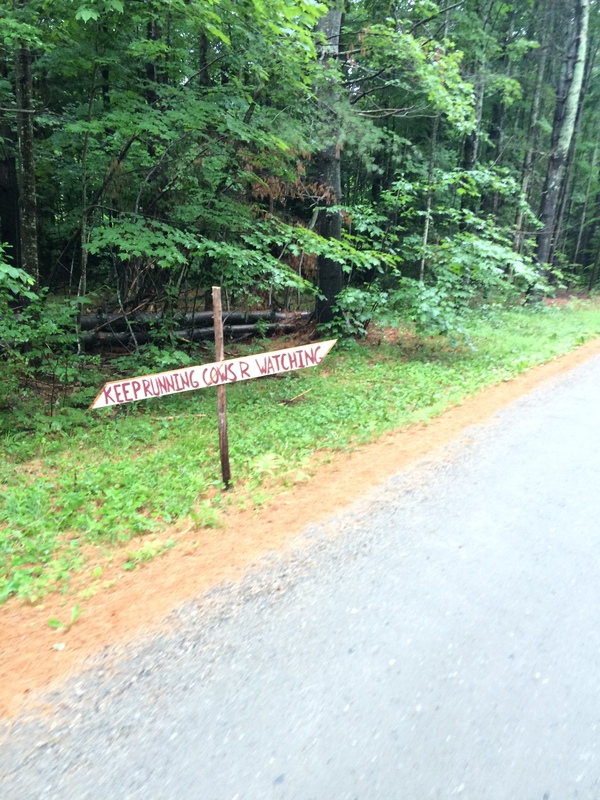 Along the way, I passed several sign posts with messages painted in thick red strokes. One said “Keep Running Cows R Watching” and another said “Ski If You Can’t Run.” A third pointed into the deep woods with the tempting, yet ominous words “Secret Shortcut” as if written by Br’er Fox, luring us into a trap. 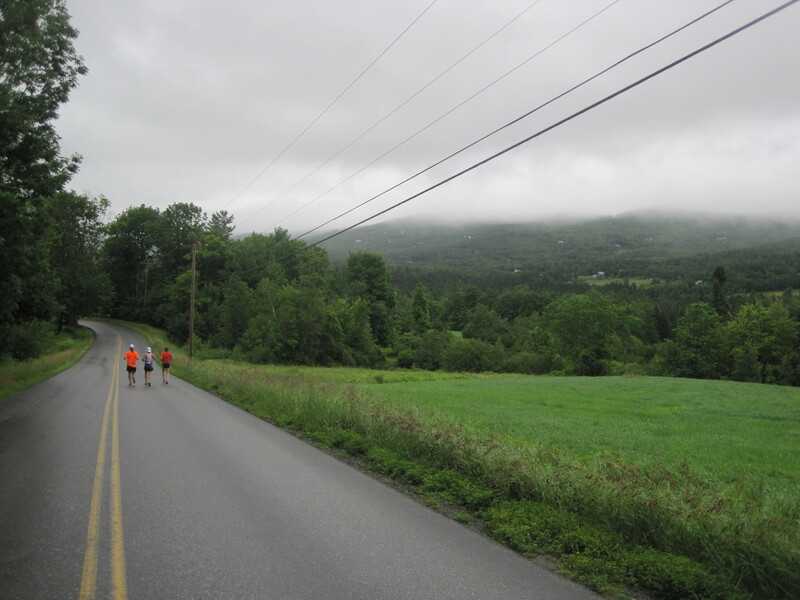 With the race’s first big hill behind us, the next four miles were mostly flat, as we ran over local dirt roads dividing large stretches of farmland. 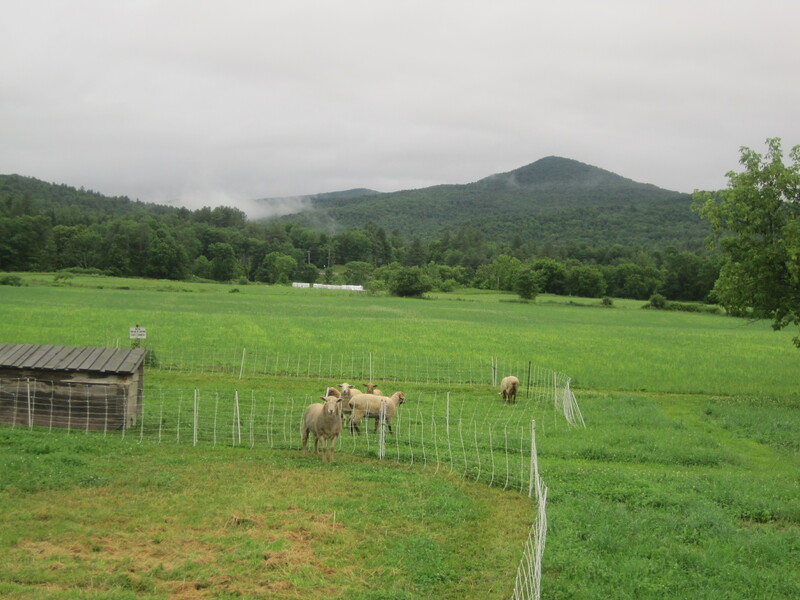 Cows watched from above, while sheep and horses grazed happily across many bucolic fields of northeastern idyll. Cratered and ridged puddles splashed underneath as winds stirred the branches overhead. The race bills itself as ‘the world’s most beautiful marathon,’ as many races do, but in this moment, I was in awe of the sylvan wonderland surrounding me. Once through with the flat reprieve, it was time to pass through our third covered bridge and begin the long climb upwards. This time, there would be no rewarding downhill on the other side. The course would instead make a left turn and continue its skyward path, totaling a length of about eight miles of near continuous uphill. Despite having walked almost every uphill section of my last race, I was determined to run through every last bit of this one. So I kept a forward tilt, shortened my stride, and tiptoed my way up, up, endlessly. 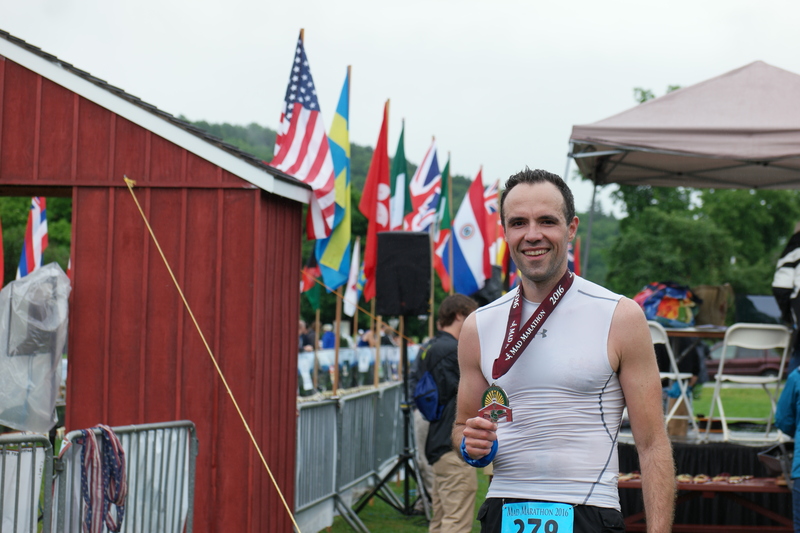 Somewhere along the way, my impossibly long streak of avoiding rain during races was delicately cut short. 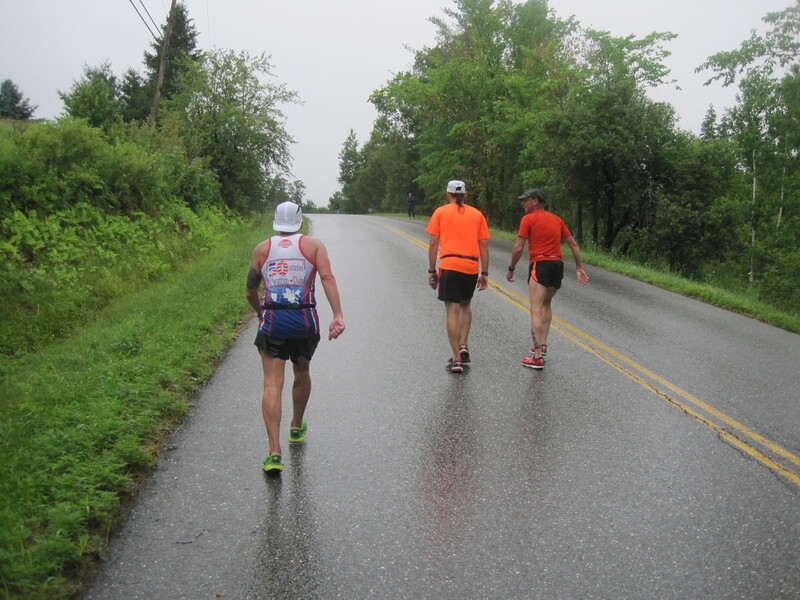 The occasional drizzle we had kept as a mercurial companion became an honest rain once we reached the race’s highest point around mile 17. Every tiny change in the road’s topography became a puddle or a rivulet, splashing beneath us as we let ourselves be pulled back down to the finish line. The problem with running downhill this far into a race is that it still requires a lot of effort, despite gravity helping us out. The bottom of my feet had taken a beating during the last twenty miles, and downhill they hit the pavement harder. Once I would either get used to it or develop a tolerable rhythm, whenever the road would flatten, it would suddenly feel like I had doubled my weight. And when faced with another brutal hill around mile 23, well, I had to bid farewell to my pride and walk the damn thing. But steadily onward I ran, watching the miles slowly tick off, silently wishing well the runners to my right, who were on the uphill portion of the race. At one point, I spotted an older runner with short, white hair and a jocular tone in his voice, talking happily with a small group of runners. I did a quick double-take. Had I not been so determined to continue running downhill without interruption, I would have stopped and said hi to Bart Yasso. Instead, I continued downward, past familiar landmarks. 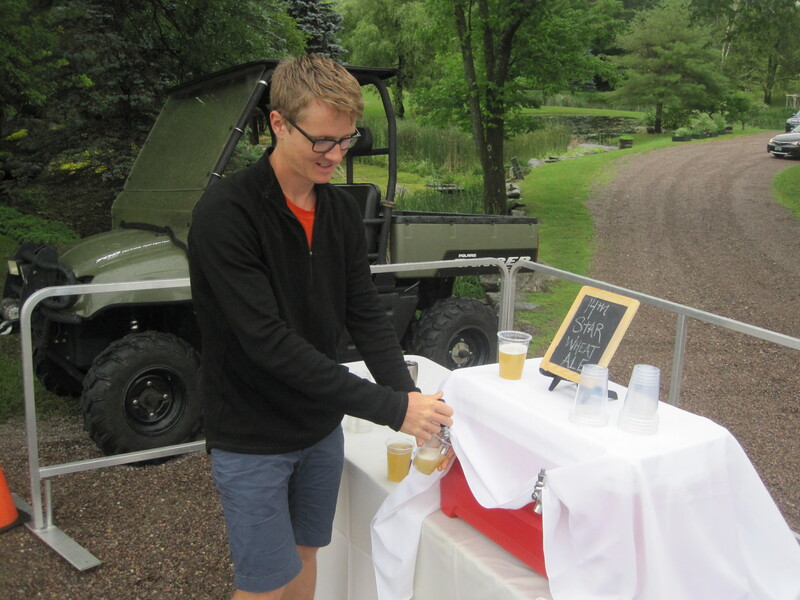 At mile 24, a typical aid station had been upgraded with a beer station, where a young bespectacled man was serving a deliciously refreshing wheat ale from a cooler. Even if my watch weren’t telling me I was just a couple of miles from the finish, beer stations normally portend the final stretch. 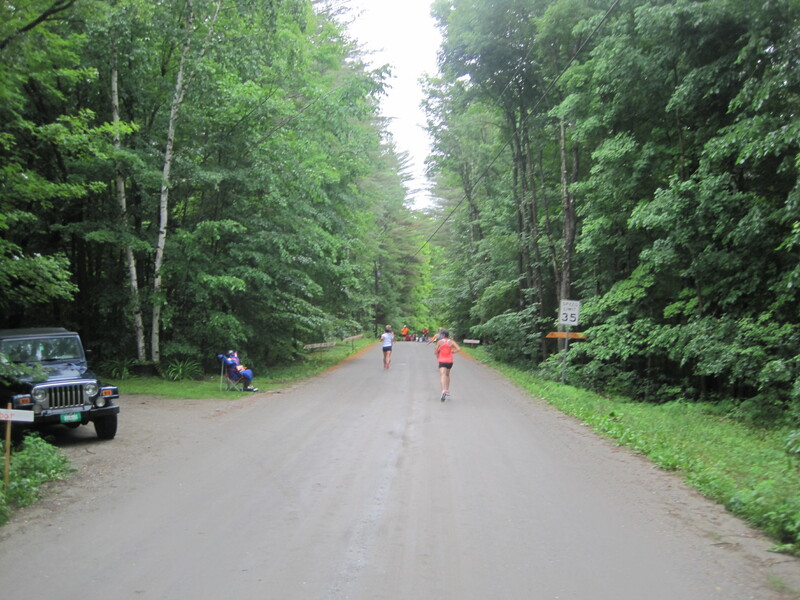 Just two more miles under the flitting, green canopy separated me from finishing my 44th state and 33rd marathon. 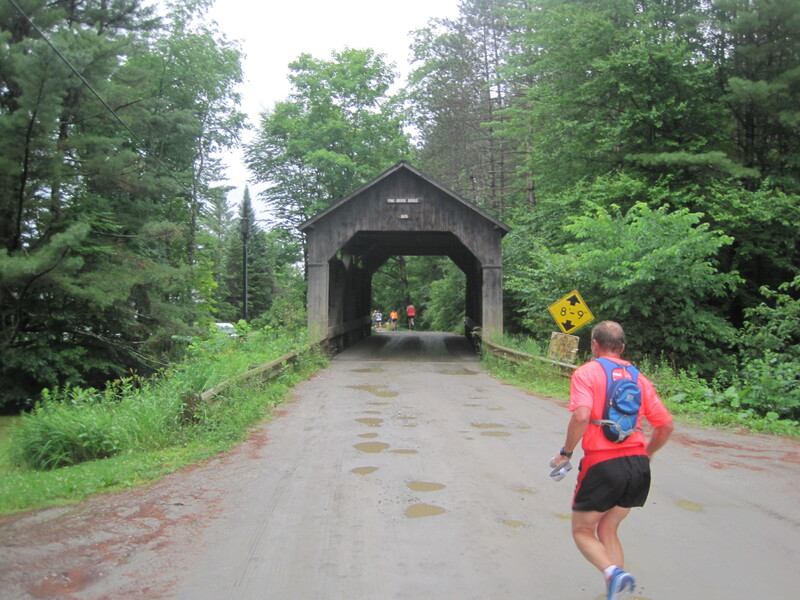 I reached the race’s fourth and final covered bridge, the same one we ran through just past the first mile marker. A friendly volunteer was stationed at the entrance, urging me to keep going. I felt like I was leaving an amusement park and she was an employee, thanking me for visiting, and to please exit through the gift shop. There was just one more mile and one more hill to crest. After a short run through the small town of Waitsfield, now awake with spectators and cars, I turned into a green clearing. Twin rows of orange cones became parallel lines of flags, presumably representing the nationalities of the race’s runners, both leading to the finish line. The announcer pronounced my last name as if it rhymed with “cholera” and I stopped the clock at 3:42:19. Race organizer Doris was there, ready to give me a hug, just like she had for every single finisher before me. I was tempted to exempt her from it, given that I was a virtual sponge of sweat and rain. But she wouldn’t have it any other way. Thank you, Doris. If you have never visited the Mad River Valley, I highly recommend it. While there, visit the similarly named Mad River Barn & Inn for a delectable squash bucatini and the Mad Taco for a variety of succulent tacos. If you’re lucky, both locations will have the famously rare and refreshing Heady Topper IPA, which should be on any beer enthusiast’s must-try list. Lastly, if you have the legs for it, sign up for the Mad Marathon and hope that, like me, you manage to wake up on race morning with an autumnal chill so that hills are the only wrenches thrown in your running gears. But I wouldn’t have enjoyed these treats from the northeast at all were it not for the excellent company with whom they were shared. Although serial marathoning can be seen as a fool’s errand (even Phil has committed to Slate’s anti-marathon program this year), there’s no mistaking a race’s ability to bring people together, runners and proud non-runners alike. And as long as there are states I have yet to run, there’s still the promise of returning for yet another round of food, laughter, and of course, many long miles. Thanks, everyone. Sounds like yet another great race. Bart Yasso? Pretty awesome. I see Nebraska is not colored in yet… what are your thoughts there? I did the Lincoln Marathon when I lived in Iowa, and I thought it was pretty good, but for all your travels, possibly just flat on all accounts. I actually just signed up for the Omaha Marathon on September 18. I’ve heard great things about the Lincoln Marathon, and was about to sign up for it last year, but I didn’t realize it now sells out in 3 hours. So I missed my chance and I moved on. Thanks for the recommendation and for reading! 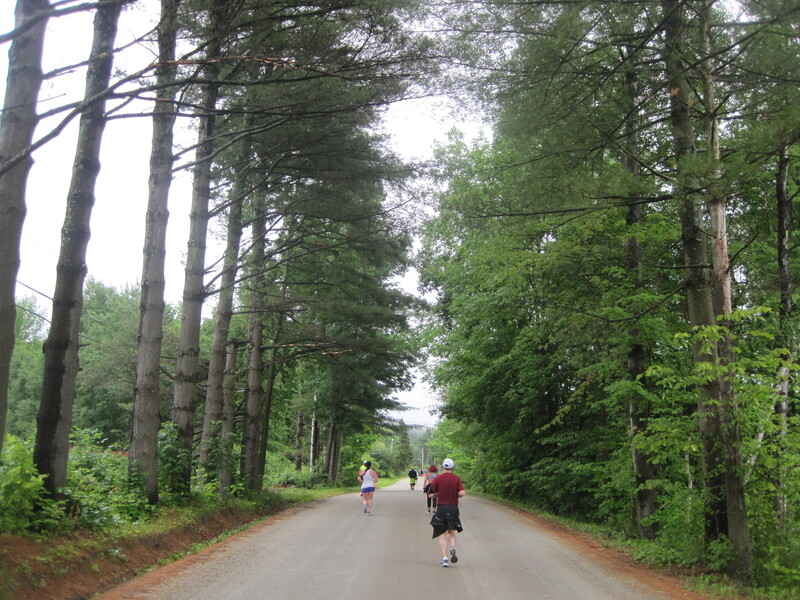 I knew about the Mad Marathon… and I knew the Mad Marathon had hills… but I had no idea the Mad Marathon had HILLS. Sounds like excellent summer training in excellent summer weather. If there’s ever a good time to get rained on during a race, it’s mid-July when the alternative is crushing heat & humidity (which I know you love). I’ve had similar dry luck, only running in the rain (and light rain at that) twice in 70+ races, and one of those was outside California. The silver lining to living in a drought-stricken state. The course looks gorgeous, it looks like… Vermont! 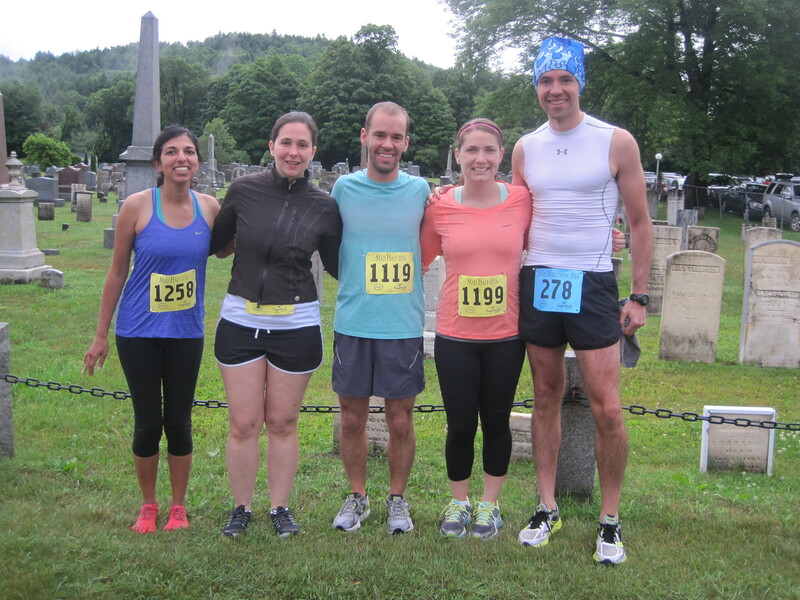 Flatten out the hills a bit and it sounds much like Hatfield & McCoy—small race, big heart. Hats off to Doris, so great to see a race director who clearly groks the struggle & euphoria of finishing a marathon, especially one as challenging as hers. And it certainly beats pacing around the finish area, walkie-talkie in hand, checking in with her crew every 5 minutes to ensure everything’s copacetic. I remember hearing from one race director that he started a tradition several years ago of high-fiving every finisher, a decision he now regrets since it’s such a grind and his hand is so sore by the end of race day. Don’t feel too bad about shorting yourself three seconds… I would’ve won my age group at the Peace Love Run Half in San Diego in April if I hadn’t run an extra loop on a poorly marked course. Instead I ended up 4th after running an extra 1.9 miles. And except for the final sentence of this post, you won’t even remember your near-miss by this time next year—just another beautiful medal in a beautiful collection (and getting beautiful-er all the time). I always love your smiling group photos of the n-1 runners sporting their half marathon bibs—plus you, the one guy with the different-colored bib signifying “Yep, I’m the lunatic here.” And speaking of lunatics… granted the likelihood of bumping into the man is higher during the summer when there aren’t as many marathons, but if I didn’t know better I’d swear you were stalking ol’ Larry Macon. The funny thing is, I’ve bumped into Larry at three races so far (Delaware, New Hampshire, and this one), and those are just the ones where I’ve physically run into/past him. I’m sure there are many, many more that we’ve shared where I simply didn’t see him or had no idea who he was. I was surprised to see that he’s still churning these out. He is the very definition of indefatigable. Anywho, I’m sure it wasn’t lost on you that this now makes two big races where I’ve brought an unseasonal chill to the event, much to my effusive delight. If I’ve unwittingly developed this as a mutant power, I’ll gladly take it, especially since my marathon plan, as you’ve noted, is still in the upper 20s, and will eventually require that I run Texas again. But all that aside, it was nice to run a new state — haven’t done that in 14 months! Thanks for reading, Mike. Something I only briefly mentioned is that Ice Age left a long-lasting mark on my overall endurance. In between Ice and Mad, I ran zero 20-milers, but despite the hills, managed to finish comfortably in one piece, without any muscle cramps. Who would have thought that running 50 miles at a time would do that, right? So true—I’m pretty sure I cruise-controlled through the early-summer heat & hills of Hatfield McCoy on that same residual endurance. Gotta admit, I’ve done disappointingly little to supplement my fitness since we emerged triumphant from the woods of Kettle Moraine. And don’t forget your Macon sighting at Fargo! Three seconds away from an age group award? That’s a bummer! This course looks so serene if not slightly soggy (you can’t prepare for hills, I can’t prepare for rain). Your map is incredibly close to being complete! 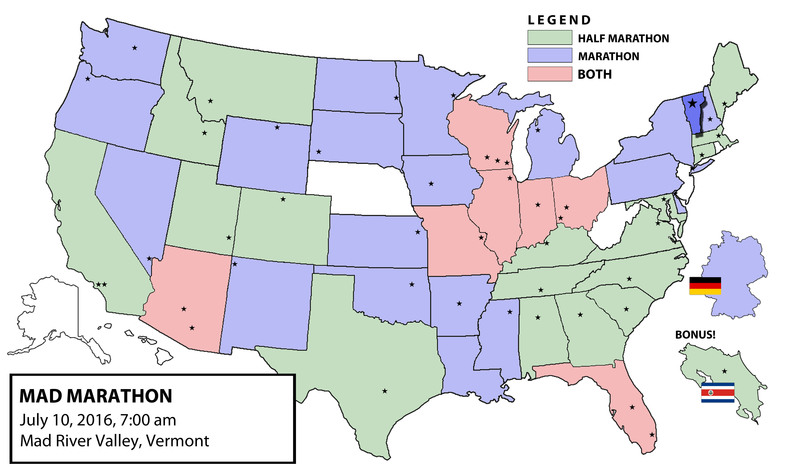 You may have said this before, but do you have an estimated timeline for finishing your 50 States? My original plan was to be done by the end of this year. I was going to tackle all of the lower 48 by the end of 2015, leaving just Alaska and Hawaii. But then I got into Berlin, so I redirected my training efforts toward that in 2015, and then Otter and I decided to make 2016 the year of the 50-miler (completed in May!). With Vermont, I’m back toward crossing some more states off the list, such that I should hopefully be done with this adventure by the end of next year … 2018 at the latest. Life can happen in between, so you never know. (Plus, I’ll eventually make this exclusively a marathon thing, and that will reset the whole pursuit, docking the count down to the low 30s). Another good read as always. Thanks (as usual). Now I’m dreaming of cooler days. We all are now … the last three races I’ve done have taken place on cool weekends, followed immediately by a harsh, warm one. I’ve had great timing this year! Sounds like I may be the rare bird who embraces summer heat training… which may also explain why I live in perennial warmth!